Another drawing from my travel themed Moleskine. And some more nonsense that, no doubt, I'll regret sharing. Hahaha...don't regret it! I feel you! If you'll come visit me in the US of A I'll be happy to buy you the sneakers! Absolutely loved your thoughts on running and breathing - thank you for the laugh! You can't kid me. 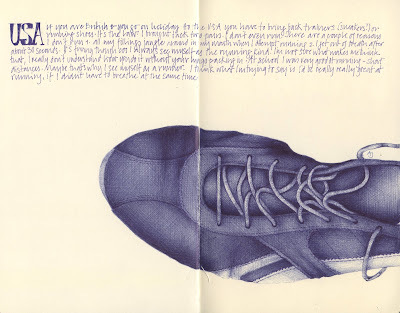 It isn't the running-it's another reason to buy (and beautifully draw) shoes! You made me laugh. I like your silliness! I had no idea there was a law about running shoes and the US! Thanks for adding to my knowledge bank! I love the drawing--it is very fine! I'm glad you shared! What beautiful lines in that sketch... it completely made me forget the awful thing that running shoes are really made for! As usual, you've produced a real winner here. Great drawing, so glad I looked closer to read the text too! Feel the same way about running - I much prefer to walk fast myself - you get to wear the same trainers, have the exercise and don't (usually) get so out of breath and shouldn't get so sweaty - unless you live in Malaysia, like me! Another study and lesson provided with insightful humor. I really enjoy examining your drawings. The tiniest details are so perfect--even when they are viewed large on the screen. This is one of my most favourite drawings I've produced in a long time. Glad you like it too. Also, glad to hear so many of you feel the same about running. I thought it was just me. You are so funny! I didn't know it was the law that UK travelers to the USA had to buy sneakers (trainers). What do travelers to England from the US have to buy? I'm impressed with your pictures. They are so-so great! I'm not a great runner...but I do love your sketch. LOL .. Love it. Don't regret it, and your drawing is amazing. Isn't it strange that there are books and techniques teaching us how to breathe?! Great job, and i love the story! I will send you sneakers for artwork! Ha! How long can you hold your breath? Does walking the dogs (er, briskly of course) count? I'm too lazy to buy lace-ups ... of course, if I did I Would run in them, honest, that goes without saying. Goes without saying too that this is a brilliant drawing. Brilliant. So do people not wear sneakers/running shoes/trainers there? I wear mine every day...to work...to walk...everywhere because they make my feet happy. They look pretty bad I suppose, but I'd rather have happy feet. These ones you've drawn look like they'd be attractive as well as comfy. Gypsy, I don't have that problem! I don't know whether that's a good thing or bad. No, Mariana, walking does not coun. I can do that too! Jana, it's not that we don't have them here, it's just that they are so much cheaper in the US. That's why we fill our suitcases up with them. We are studying you in art I need to know what year you were born in ? ?